Dude, That's Dope - we're the family they warned you about. 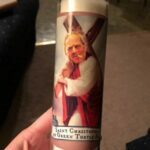 One-of-a-kind prayer candles featuring anyone's face! Yours, your boss, your pet, your mother-in-law, your favorite celebrity - the possibilities are endless! Such a fun, personalized gift - great gag gift, perfect for a white elephant party, spectacular on your mantel! * This is a custom designed product, and as such, requires 5 to 8 business days to process and ship. * You must provide a clear, non-obscured, non-blurry, front-facing, high-resolution color photo at time of purchase. 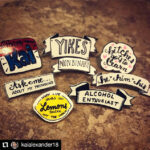 Send through Etsy messages. * Unless other arrangements are made, I will choose the design/saint based on what will work well with the photo you provide. * If you would like a proof, please say so at the time of ordering. I can provide one proof before printing, at which time I can do slight adjustments or modifications. Any editing beyond the one proof will be billed separately at $10 per 15 minutes of editing time. * PLEASE BE SPECIFIC with what you want! I will do my very best to give you the candle you want. If you want your saint to be holding a donut, or a cell phone, or a wine glass, or a dog biscuit, or a giant bong, please let me know. * The example images shown here are representative of possible designs. The candle you receive will not be an exact replica of any of these. Every candle is unique and special and no two are exactly alike. * IMPORTANT! 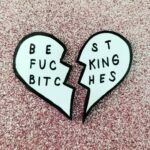 Etsy does not allow sellers to alter the shipping address after purchase. If you choose the wrong shipping address, I will have to refund your order and you will have to repurchase using the correct address. This is a protection for both the buyer and the seller. Get on the list to receive updates and special deals! Definitely a high quality handmade pin . Very clever ! 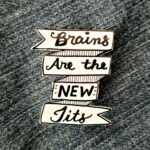 Great pin ! I am overwhelmed by the thoughtfulness! So cute! I will be ordering more. LOVE IT!! looks great on me and my best friends fanny pack!! It’s too nice to burn! I bought my mom a prayer candle featuring her dog with his full name (yes my mom gave her dog a middle name). She’s Catholic and I wasn’t sure if she’d see the humor in this gift but she loved it - she said it’s too nice to burn! OMG. I sent in a funny picture of my husband giving me the “stink eye” and turned it into a Saint Stink Eye prayer candle. He couldn’t stop laughing when he opened his gift on Christmas. Amazing work - I wasn’t sure this picture would work since it was a side view of him but she took the time to make it work! I could not be more pleased with the creative process, product and customer service. I would most definitely recommend her work and most definitely work with her again, total gem. The candle I requested turned out amazing. I was nervous about the vendor being in control of the final edit but it was even better than I imagined. I even accidentally double purchased the candle and the vendor refunded me immediately. Will definitely buy again in the future. These candles were awesome, shipping was super fast and perfect, and my sister turned her house into The Catican with these candles. Thank you! Shipped on time, lovely packaging, great quality. Thank you!